Last year prior to Christmas I was organised enough to book tickets to the Nutcracker Ballet at the National Theatre for me and Lucie (then 5). It’s a magical time of year and this is the perfect way to spend an evening. 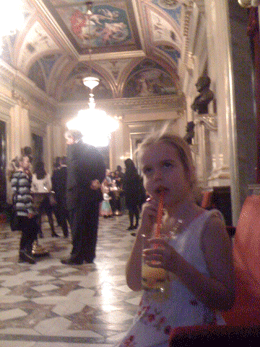 Dressed in our finest, we sipped our drinks in the theatre bar and then went on to enjoy our night out at the ballet. It beats sitting through a Disney movie for the umpteenth time, thats for sure! It may seem early to talk about Christmas activities but you should reserve your tickets NOW if you want good seats and dates. These performances do sell out. 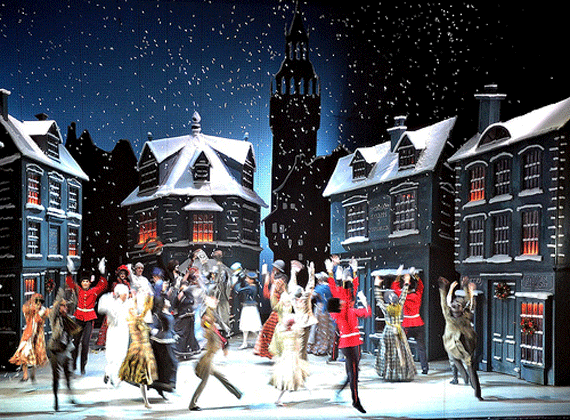 The ballet is modern adaption combining elements from Charles Dickens’ A Christmas Carol and Tchaikovsky’s Nutcracker Suite. The program showcases many ballet styles and an array of costumes but still features the most famous ballet scenes such as the Dance of the Sugerplum Fairy. There are both evening and matinee performances from 1st December right through to 12 January, 2013. We had seats in the upper balcony area in the centre. The seating is quite steep and very high - I felt a little bit of vertigo looking down when I was standing up. 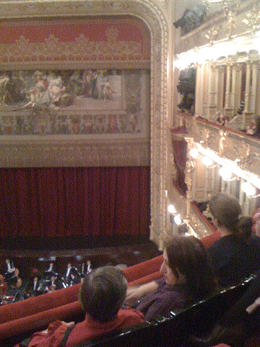 We did have a clear view of the orchestra tuning up as well as the stage once the action began. The opening scene began with a busy street in 19th Century London with shopkeepers and village folk rushing about in the lead up to Christmas - the character of Scrooge was introduced, his stingy attitude to his workers and the townsfolk was demonstrated. Later in the piece he is visited by a spirit who transports him on a flying bed to various scenarios where he becomes aware of his behavior and begins to warm to humanity over the course of the production. 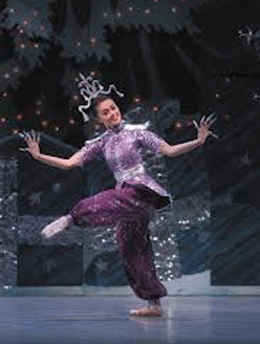 This is when scenes from the Nutcracker come into play - children wake to presents - toys come alive (including a Thai dancer), Clara and the Nutcracker (now a romantic prince) dance their way through Tchaikovsky’s classic score as does the Sugarplum Fairy. 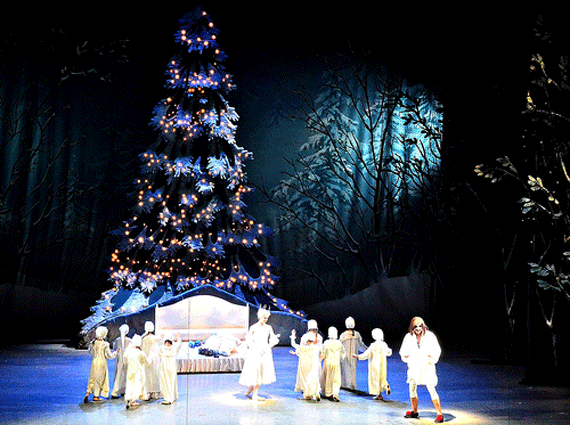 The National Theatre production is choreographed by Hungarian Youri Vàmos and his modern adaption aims to explore the magic of Christmas to transform human character. I found the program entertaining, diverse and thought it easily digestible for the young audience members that were present. There are programs for sale which explain the story in detail - I think this would be quite handy to help translate the action for kids, but i’m afraid that I don’t know if the program is also in English (probably a good chance of that). The performance runs for 2 hours but it seemed to fly by for us. There was an interval half way that allowed for treats and a toilet break - take this time to explore the various floors, there is one particular bar that overlooks the river, another with a huge fresco ceiling. 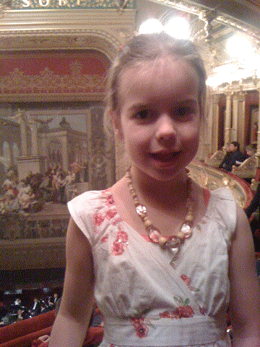 Lucie loved the drama of the theatre and the various styles and costumes on show. But most intriguing for her (besides the Thai dancers long metal nails) was the orchestra - particularly the Drums, Harp, Violins and the Celesta - used so prominently in the Sugar Plum Fairy. The National Theatre has recently launched a great new website that is extremely easy to navigate - it shows you the performances that are on every day in 5 different theatres. You can also choose your seat, reserve it and pay for your tickets online - this is what we did, all you need is a credit card and then you print out your ticket and take it along with you to the performance. Alternatively, you can visit the box office at the National Theatre and pay for your tickets over the counter. One of the great pleasures available to us in this city is the wealth of artistic expression priced at a fraction of what you would pay elsewhere in the world. Exposing this diversity to our young children is a great gift that could inspire them in unexpected ways later on in life. I highly recommend this show to any child (male or female) 5 and over (maybe 4 depending on their temperament) - it’s a great introduction to artistic performance, as well as a special treat at Christmas time. DIRECTIONS: By Tram: Take Tram numbers 6, 9, 17, 18, 21, 22, 23 to tram stop Národní divadlo. By Car: There is a paid underground carpark at the National Theatre for 50CZK per hour.